I repeat, SUMMER IS NOT OVER. As I try desperately try to hold onto the last bit of the season; margaritas on the patio, sun-kissed cheeks, and, of course, my beloved tank tops and flip flops, the world is happily trading in their key limes for pumpkin at an alarming rate. I mean, c'mon. We've only just got our gazebo up. Let me enjoy it a little while longer. If that doesn't add injury to insult, the fact that there are Halloween costumes, decorations, and a plethora of pumpkin-shaped candy displayed in all their gory and glory in shops all over the city really isn't helping my case. So until that very last leaf slips into something more jewel-toned, this Mama is not going down without a fight. I am gonna happily eat these amazing treats and sing campfire songs around the pit. In my bathing suit. Complete with rubber ducky inner tube. If they fit after eating all of them. These bites are a fun take on the already amazing Take 5 candy bars (and the sadly discontinued Max 5 bars in Canada). Prepare a cookie sheet by lining with parchment paper. On the top side of a marshmallow*, apply a generous dollop of peanut butter; on the flip side, apply a generous dollop of dulce de leche. Place 2 pretzels on either side and apply slight pressure. *If you find the marshmallow is too big, feel free to cut it down to accommodate your preferred size. The chocolate coating will cover any imperfections. Melt coating chocolate in a heat-proof dish, or if using CandiQuik, prepare according to package. Dip entire assembled pretzel into chocolate, allowing excess chocolate to drip off, and place on parchment paper. Immediately sprinkle with graham cracker crumbs. Allow to set before enjoying. I will cling to summer by my teeth!! STAY SUMMER, STAY! These bites look like lil pieces of heaven, YUMMMMMMYYYY! Oh, I am trying to get outside and enjoy as much of what is left of summer. 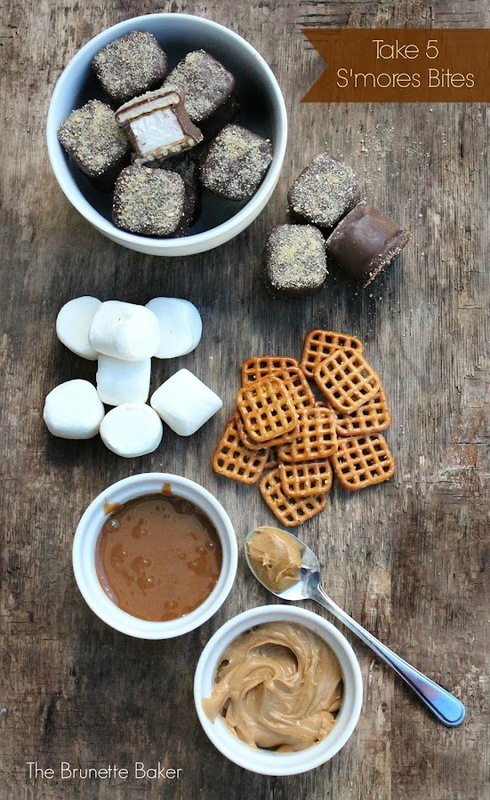 These Take 5 S'more Bites look delicious! I with you! I'm hanging onto the last of Summer as long as I can. I love these little s'mores bites. Baking these in the middle of Winter will go a long way in remembering and looking forward to the return of my favourite season. DO NOT look at my blog. I have dived into fall with wreck-less abandon! :) But I'm sure that come December I will be crying about the end of summer and cursing my pumpkin loving ways. These look amazing!! Take 5 bars are my absolute favorite, so I can't wait to try these!! Pinning! Holy moly, these little treats would be so dangerous at my house! Thanks for linking up with What's Cookin' Wednesday! These look awesome!!!! Love a s'more I can enjoy all year round!